Do you ever feel like you just don’t have enough time in the day to do everything that needs to get done? The real problem, however, is not that we don’t have enough time, but that we aren’t using the time we do have wisely. 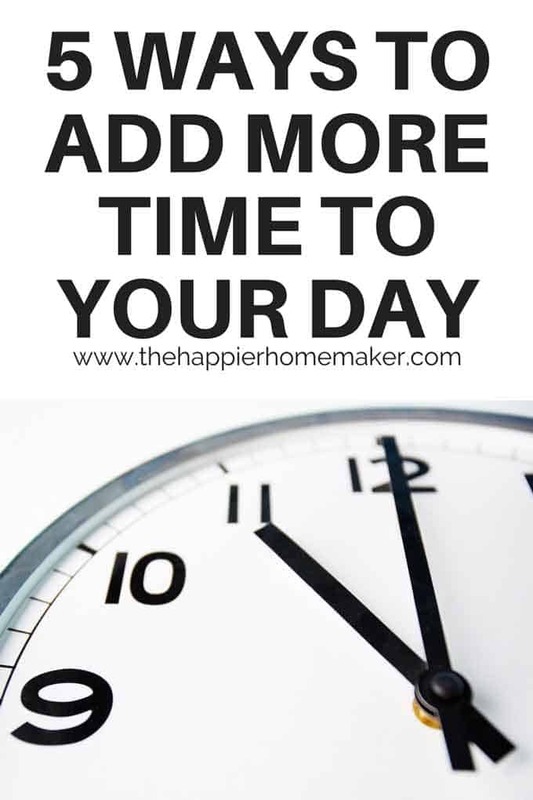 When we break down our days realistically and take a few simple steps we can add literally hours to our day and increase our productivity and reduce our stress easily. This tip is one that tends to make people mad at me when I’ve mentioned it in the past. It amazes me how many people tell me that they don’t have time to exercise, or meal plan, or clean their homes but they can tell me who got kicked off The Bachelor the night before or who’s performing the best on The Voice that week. Television is fluff. It’s entertainment. We all need to relax and unwind but if you are having trouble accomplishing everything you need to in the day and then spending hours at night staring at a glowing box then we need to reprioritize! Each morning I block off time in my planner for the big, must-do tasks of my day. (See this post for the planner I use and how it helps me increase my productivity.) Every day there are things that have to get done, things that would be nice to get done, and things that aren’t time sensitive. Schedule those “must-do” tasks each day and then knock them out! This prevents you from getting stuck on the small stuff that can sneak in and take up too much time. Just like the television above, our phones have become a source of massive amounts of wasted time in our days. We almost always have our phones with us and the constant alerts and notifications can prove to be a big distraction. For at least a little while each day put your phone on mute, turn off the notifications, and stay away from it! You’ll be amazed at how much faster you can get things done with you aren’t checking Facebook constantly for the latest news feed updates! In my book Bite Size Organize I talk about how I used to always put off unloading the dishwasher in the mornings. I would run it each evening and then procrastinate unloading it in the morning and as a result a pile of dirty dishes would fill the sink every day after breakfast, causing me more work later. One day I unloaded the dishwasher as I was microwaving something and I realized that the entire process-start to finish-took me only two minutes. TWO MINUTES. All that effort to put off doing something that took 120 seconds of my life but saved me massive amounts of time later in the day by simplifying the dishwashing as the day went on. Procrastination will ruin your productivity. If something needs to be done just do it. Ninety-nine percent of the time it will save you time and effort in the long run to get it done immediately. So much of running an efficient home and keeping your home clean can be streamlined if you simply get in a routine. I don’t know how many blog posts I’ve written about this in the past five years or how many pages of my book go back to emphasizing this-routines will save you when it comes to running your home. Every Monday morning when my family gets up for the day myself and my three children all strip the linens off their beds and take them to the washer. Even my five year old does it without much thought-it’s a habit we all are used to. I never have to stop and think about when the last time the linens were washed because I know they get cleaned every Monday. Just like the bathrooms are cleaned on Tuesday and the dusting is done on Wednesday. Creating a routine for regular tasks saves you time and mental energy. You can find numerous cleaning schedules here on the blog or if you have my book it comes with 25+ pages of home organizing printables to help you get in a routine as well. Try it! So there you have it-5 easy ways to get more done each day. Try one or two of these tips this week and see how it can help-then let me know in the comments below! You are so right. I am not so much into tv as I am to reading, and yes my smartphone. We have a.cleaning service, which. Is a total waste of money. I would like to sign up for your email course and perhaps that would g ed t me back on track.